I have always thought that going skiing in Europe is like having a second home in Palm springs or a vintage ’56 T-Bird. It is proof positive that one had achieved the rare state of having more money than brains. 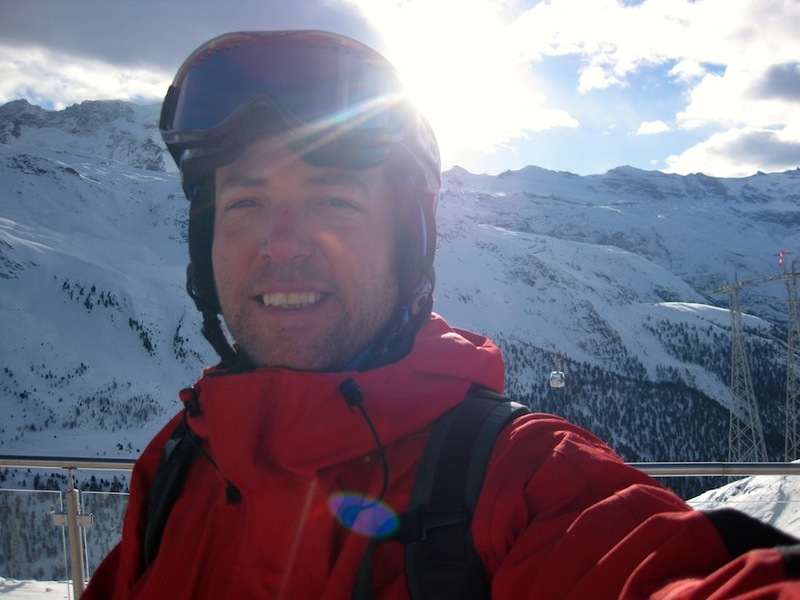 sun, snow and skiing demand a selfie. Why would anyone who grew up skiing at Sunshine, Lake Louise, Whistler Blackcomb or any of a number of equally incredible resorts in western Canada want to incur the expense and trouble of going to Europe to ski? Having been to Zermatt, I can now understand why. 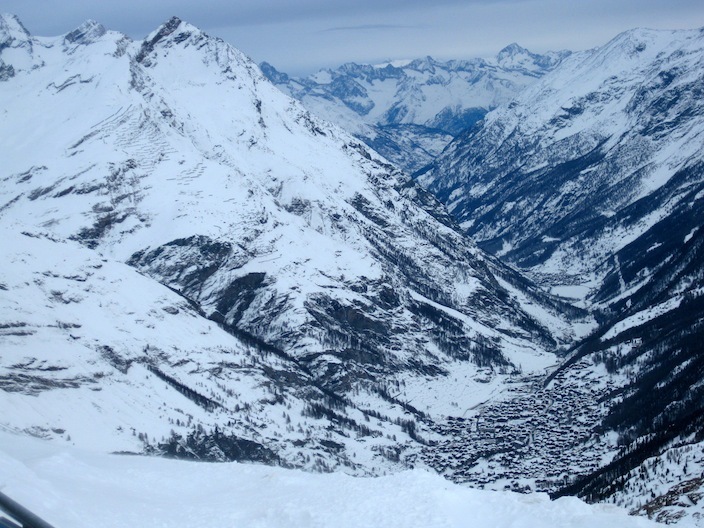 Zermatt is, quite simply, a skier’s Wonderland. 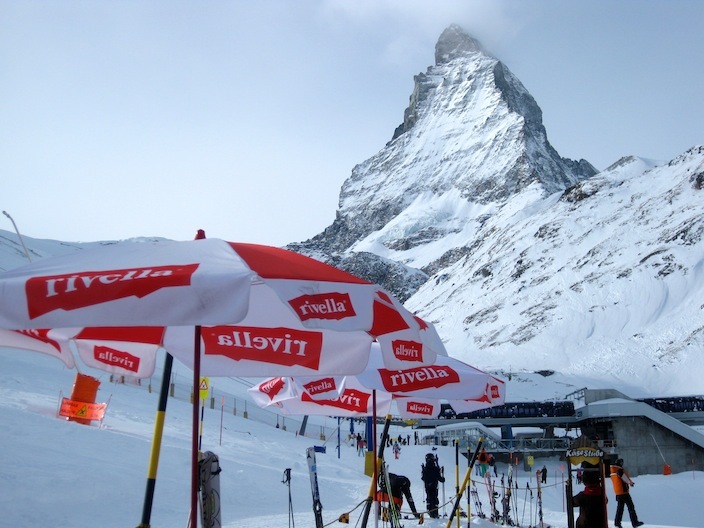 Zermatt is the iconic Swiss ski resort, dominated by the Matterhorn. 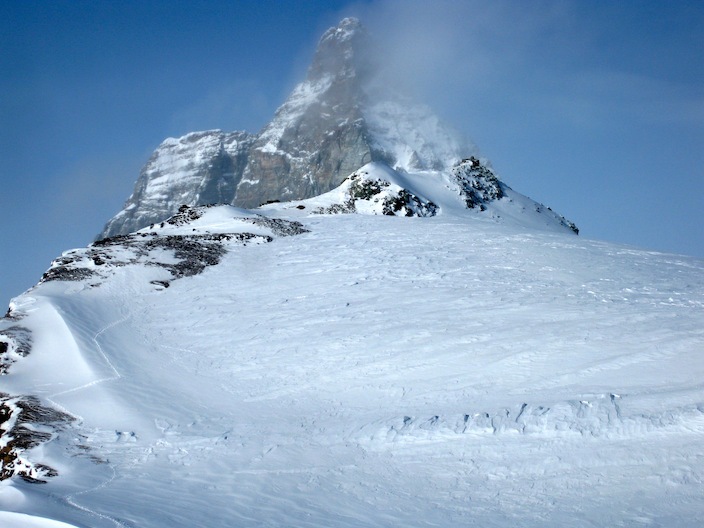 The Matterhorn is hard to miss, arguably the most famous mountain the Alps; it is immediately recognizable. 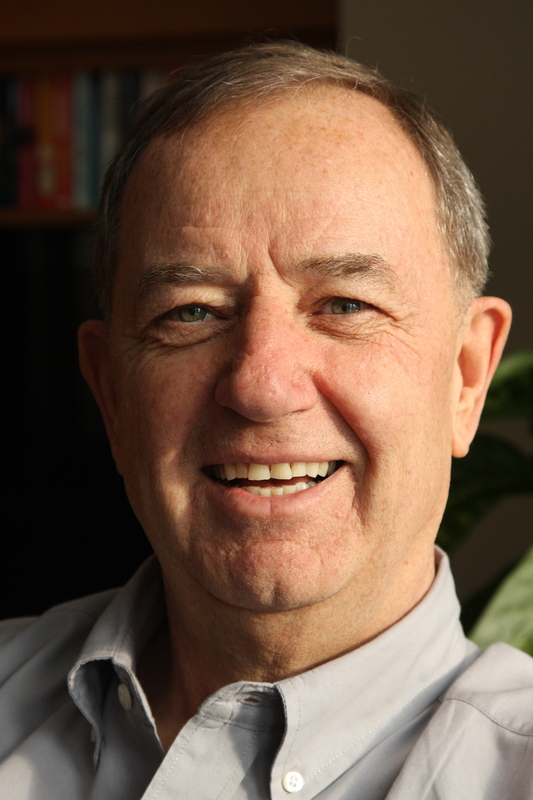 It commands our attention; the eye immediate searches for it; it becomes the fixed reference point for all further activities. 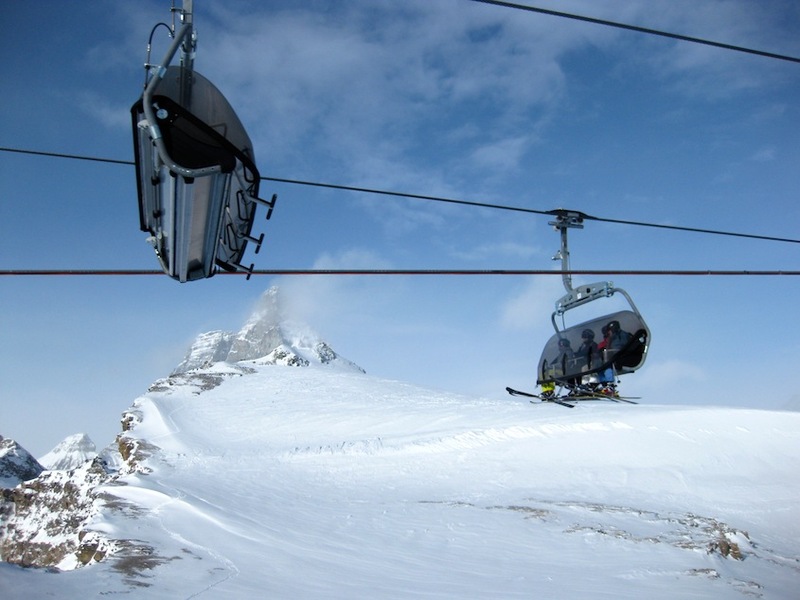 Zermatt sits at the top of a long valley, the last stage accessible only by rail. The train from Basel is three hours of Swiss efficiency and post-card views. No cars are allowed in Zermatt, a few small electric taxis about the size of golf carts are used to move people, luggage and supplies around the town. We stay in a small hotel near the town square, a fifteen minute walk from the train station. The walk up to our hotel is like a walk through a fantasy, it is the idealized Swiss village of my imagination; children playing in the snow, mothers and father pulling infants on sleighs, horse drawn carriages with sleigh bells, stylish skiers in the latest outfits, all wandering past a thousand exclusive watch shops, ski outfitters and boutiques. 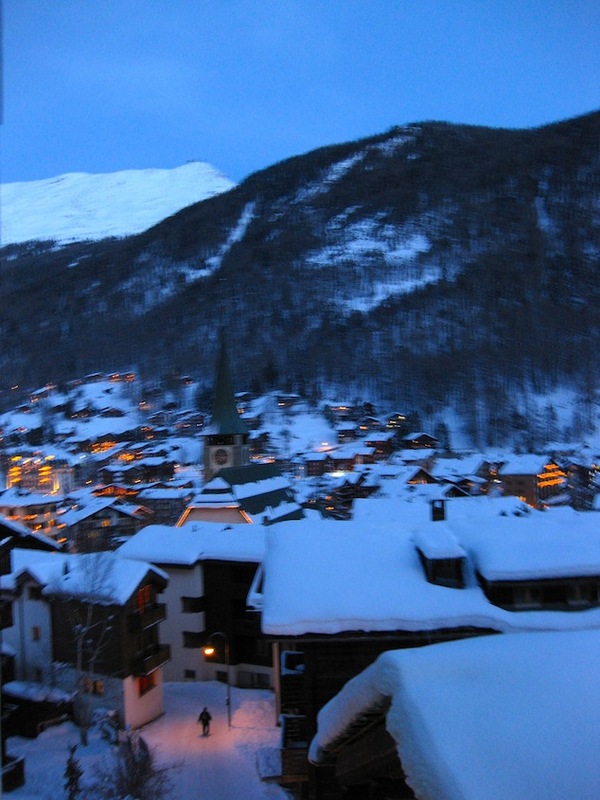 Main street is a shopper’s paradise; Zermatt is not a Walmart town. We settle in, head for lunch; a simple bratwurst meal requires more Swiss Francs than my frugality would usually allow – but hey, this is Zermatt and it is authentic Swiss bratwurst. I don’t even try to figure out what lunch costs in real Canadian currency. Next morning, we load up on Swiss Muesli, a gooey combination of fruit and granola soaked in yogurt till everything is soft as mush, it’s remarkably tasty and surprisingly filling. Blair heads for the slopes and I pack my snow shoes and head for a trail that will take me to end of the first big lift, Schwarzee. Blair’s lift takes minutes to the top; all the lifts seem to be state of the art; I think when they become outdated here, they are shipped to North America, where, to us, they again become state of the art. Blair skis so many different runs he cannot keep count. He skis into Italy, right next door, he takes some runs under the shadow of the Matterhorn, he crosses over to a separate mountain whose runs were more extensive than a whole resort in North America. I gave up skiing may years ago; with snow shoes on my back, I hike a groomed trail to Schwarzee, the first big lift on the mountain. The Matterhorn dominates my view and captivates my imagination. I am as close as I will be in winter. After a strenuous three hour hike with over 1000 meters of elevation, I reach Schwarzee and catch the lift downhill to the village to enjoy a delightful late lunch (and a nap). Like the runs, Blair has an incredible range of lunch choices; restaurants are everywhere on the slopes. When the lifts shut down for the day, Blair is forced off the slopes. We pass on a Swiss dinner and choose a rather ordinary looking Italian place on main street. The food is way above ordinary, it is incredible. Blair, a certified lasagna expert, says this lasagna completely reverses the normal noodle to sauce ratio, he has trouble finding noodles in all the sauce and cheese. It is memorable and sets a new standard by which he judges such things. The next day we are both useless. We sleep late, eat enough muesli to be embarrassed and wander the town. Zermatt is unique but, also, I think representative of the European view of skiing. We are brash, intense, driven, competitive; skiing is serious. When I skied we started early, took it seriously, always pushed ourselves a bit, stopped only for quick lunch and collapsed at the end of the day. It seems to me the Europeans are far less intense about the skiing part of their ski vacation. 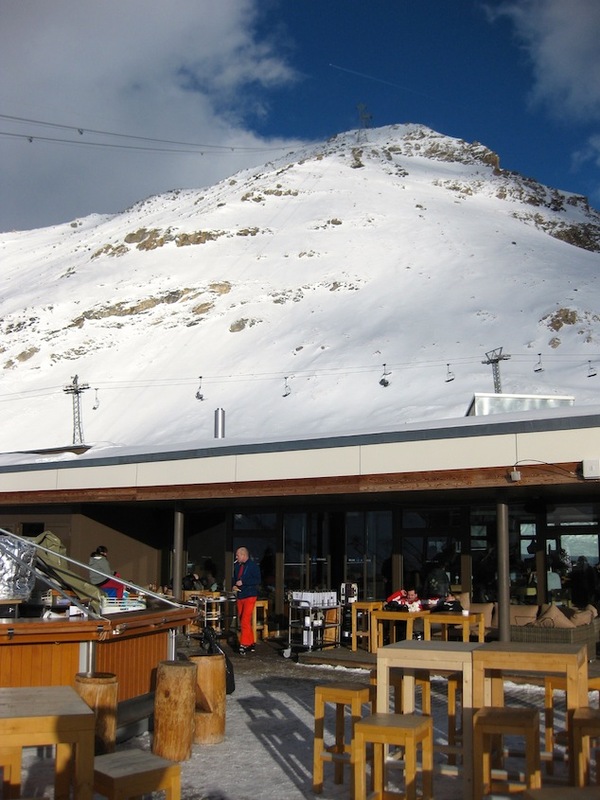 The day involves some skiing, a pleasant lunch to enjoy the view and the food; apres-ski is equally important with shopping, people-watching, rubbernecking. The proliferation of watch shops, with prices that exceed some of my real estate transactions, alone require hours of ambling, contemplation and consideration. The Zermatt vibe, the ambience, was, well, so European. Every moment of our little adventure was special; it was pricey, but well worth the expense – if for no reason more obvious than the joy of watching the Swiss/Europeans at play. While I haven’t forsaken my love of the Rockies or recalibrated my fond memories of skiing across the west, I see merit in the European approach to life. Every once in a while it’s nice to take a Ferrari for a test drive. This entry was posted in Uncategorized and tagged Hike, matterhorn, skiing in Europe, Swiss vacations, Zermatt, Zermatt skiing, Zermatt snow shoeing. Bookmark the permalink.